News broke today that a man has written some Chronicles of Narnia fanfic and, for some reason, this was deemed worthy of inclusion in numerous newspaper and online articles. From a Guardian article last year. 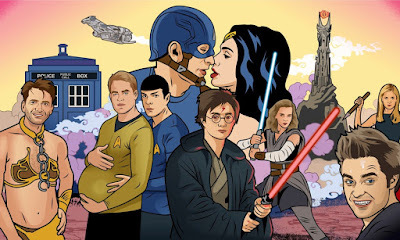 Fanfic, short for "fanfiction," is the form where fans of a fictional work take it upon themselves to write stories in the same setting and featuring the same characters. These works are, by definition, unauthorised and the writers cannot sell or make money from these stories without engaging in copyright violation. The attitude of authors to fanfic based on their works varies immensely: George R.R. Martin disapproves, but generally doesn't make too much of a fuss as long as fanfic is not sent to him. J.K. Rowling is somewhat more supportive of the concept. Some authors are a lot more enthusiastic and even host fanfic on their website, although this becomes legally dubious if the author later makes story decisions in the "official" material that echoes the fanfic. In the case of The Chronicles of Narnia, the situation is both less and more clear: C.S. Lewis died in 1963, so is not around to make any judgements of his own on the matter. The Lewis Estate has resisted anyone writing "official" new Narnia material, but has been happy to authorise various adaptations for television and film, with Netflix being the latest studio to pick up the rights and begin development work of a new version of the story. Curiously, around the time the first Narnia feature film was released in 2005, the Estate did suggest that new books would be released as well, but nothing ever materialised. The fanfic in question is called The Stone Table and takes place between the events of The Magician's Nephew and The Lion, the Witch and the Wardrobe, explaining what happened to the rulers of Narnia and the castle of Cair Paravel prior to the events of the latter novel. This is a fertile area for exploration - and the title and premise feel potentially like Lewis inventions - and indeed this period has been discussed many times by Narnia fans over the years. Francis Spufford - who has previously published exactly one novel (Golden Hill, in 2016, which won the Costa Book Award) - wrote the fanfic for his daughter, who had complained that her father had not written any books she felt like she could read (Spufford has mostly written non-fiction on adult subjects). Spufford spent three years working on the fanfic, which is apparently novel-length, which is not an inconsiderable time period for one fic. Oddly, Spufford has declined to post the work through any of the established fanfic communities, instead only releasing the first couple of chapters at the urging of friends who have read the full book. Distinguished SF author Adam Roberts has acclaimed the book as being excellent and a worthy addition to the Narnia canon, which is a nice compliment. However, given that the only person who can make that determination is near sixty years dead, it's not particularly germane. Spufford has apparently now reached out to the Lewis Estate to see if the book can see print in some fashion with their approval. If not, he'll apparently wait the fifteen years until the books leave copyright and publish then, which feels like an odd choice to make when there are plenty of fanfic communities who would be happy to release the book and critique it immediately, for free. Or, of course, he could follow in the footsteps of the great fanfic trailblazer and innovator E.L. James, change a few names to create a new setting and cash in straight away. I'm not sure why everyone's so snarky about the guy acting, seemingly, entirely correctly. He wrote a story for a private audience - nothing wrong there. He chose not to publish it - nothing wrong there. He says he won't violate the intellectual property of the estate by publishing it while they still hold the rights, unless they give him permission - seems very decent. He says he may publish it once the rights lapse - which is what time-limited rights are for. Yes, there are grey-area places on the internet where he could publish anonymously. But why should he? There's nothing wrong in respecting Lewis' rights and the rights of his estate. There's nothing wrong in not wanting to get himself sued and his reputation damaged. There's also nothing wrong in not giving away for free what may be worth something one day - Spofford doesn't owe us anything. If he wants to keep this permanently for just himself and his daughter, that's absolutely his right! Personally, I'm sceptical of IP, particularly as applied to creative arts. The copyright should lapse far sooner, the lawyers should be less zealous, and I think it's good when authors adopt a less aggressive strategy toward enforcement. I think Narnia should already be public domain. I have no particular problem with people who publish Narnia fanfiction, even in cases where it's blatently illegal (as it sounds like Spofford's book would be). But if he doesn't feel comfortable doing that - whether for legal reasons or for reasons of personal respect for the author - that's really only his business and his alone, and nothing to do with any of us. Really, aren't there worse things for us all to be outraged about today than "acclaimed author doesn't share story"? Not to be argumentative, by the way, but I'm genuinely puzzled by your headline. "Inexplicably"? To me, it seems very easy to explicate. - he won't let us read it. There's no great mystery to why that's a news story! Spufford writing a new novel is news all by itself - he's won the Costa Book Award, the Ondaatje Award, the Somerset Maugham Award, and the Sunday Times Young Writer of the Year Award, among others, and been nominated for the Orwell Prize. He's been translated into at least nine languages. When someone wins the Costa for First Novel, there's always excitement for their second - just as there was for his predecessors, like Jeanette Winterson or Zadie Smith. If you then tell people excited to see what he does next that his next project is a prequel to a novel many of them loved as children, they'll be doubly excited. And if you then tell them that, sorry, you probably won't be able to read it for another decade and a half... well, that becomes a story with enough bite to be worth running! The key fact is that "guy writes Narnia fanfic, like thousands of other people have done, except with this guy for some reason we're not going to use the term and we're going to make a thing out of it." Lots of respected, talented writers write fanfic. Naomi Novik even set up one of the Internet's biggest fanfic communities and websites. It seems that this guy considers himself better than the community and snootily above it all, and that his work is so good he deserves special treatment which other fanfic authors are not worthy of, which of course is going to rankle the community a lot. If he wanted to write a private Narnia fanfic for his daughter, awesome. Maybe he should have not then massively publicised it online to try to pressurise the Narnia Estate into letting him publish it? Or he could have perhaps contacted them privately to discuss the matter and if they said no, not seeking out publicity for the matter? The idea of a celebrated author writing a new Narnia novel is surely worthy of comment, especially when it's been read and championed by other celebrated authors too? I don't see any evidence that Spufford himself cultivated the media attention - he simply showed it to his friends, who talked about it on twitter, and it got picked up from there (am I missing something?) It's natural it would get picked up and commented on more widely than the various Narnia fan fictions online. People are more interested in creators who've already been successful delving into existing worlds than they are in writers they haven't heard of posting online - that just makes it more newsworthy. I for one would love to read this.